The other day, I was taking public transportation. I had already plotted my course online, so I knew where I was going. The plan was set. I arrived at the station, got off of the train and exited. I took the escalator up which leads to ground level outside. As the sidewalk became eye level, I noticed my bus. I hurried off of the escalator to approach the bus that had seemed to have stopped. I thought, “Perfect! It’s at the sidewalk!” As I scurried to the bus, with my hand in the air to hail the bus-turned-taxi, the bus took off. Well, so did I. I started jogging, because I figured he’d see me this time for sure. HE. DIDN’T. As I caught eye contact with a couple of bus riders, they got smaller and smaller as the bus left the parking lot. Needless to say, I stopped jogging. So, I walked to the bus depot and waited for the next bus to arrive. Although I didn’t catch the bus, I would’ve never known if I didn’t try. That’s it. You have to try. Why wonder what will happen? KNOW what will happen. 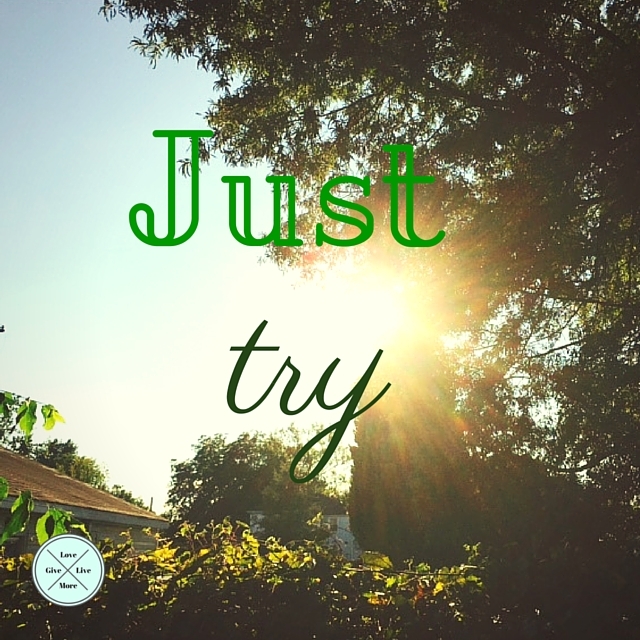 Just try. Try Try Again! That’s what I always tell my students. Its the simple things in life…. I always tell my students, “try, try again”. It is the simple things in life that make it grand! That’s the truth. You have to just keep trying. That’s just it. Simple is how life is supposed to be. We become adults and make things complex. I marvel at how easy kids take life.